Do You Move Or Rename? 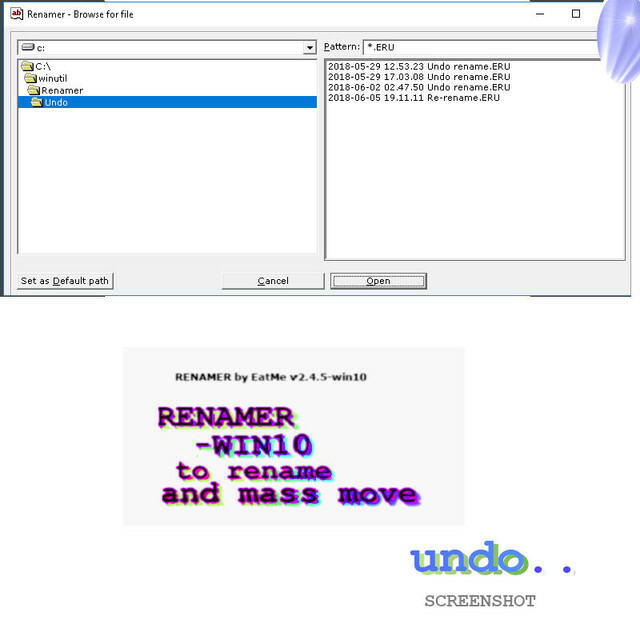 Renamer can mass rename and move files. YEARS OF DEVELOPMENT HAVE GONE INTO MAKING RENAMER WORK PERFECT. 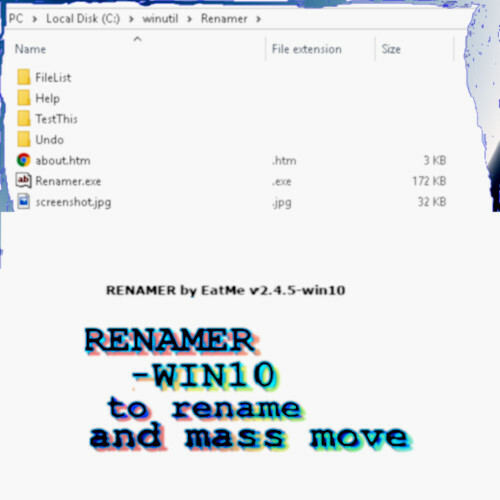 RENAMER IS A VERY POWERFUL RENAMING TOOL. DO NOT RENAME YOUR MOM. Windows 10/7 and 98/nt/xp application for directory creation, file moving, file renaming and file attribute setting. Wildcards, drap-and-drop, and (sub)directory/(sub)folder structures are supported. Saves undo and redo files by default named with the renaming date and time, can also load and save filelists to rename. Renamer v2.4.5 is bugless and available. Renamer won 5 star awardson various freeware download sites! File attributes setting is disabled under non-win98 systems. 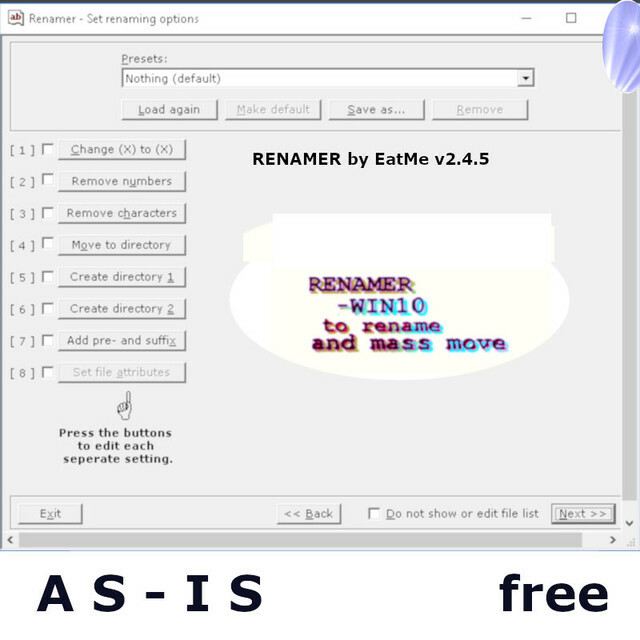 Extract the files from Install Renamer 245.exe with WinRAR for custom installation (help included). !! Windows 10 and 7 users: Keep Renamer out of the Program Files and Program Files (x86) directory. Due to directory structure security for saving filelists and undo files in the Renamer subdirectories/subfolders. 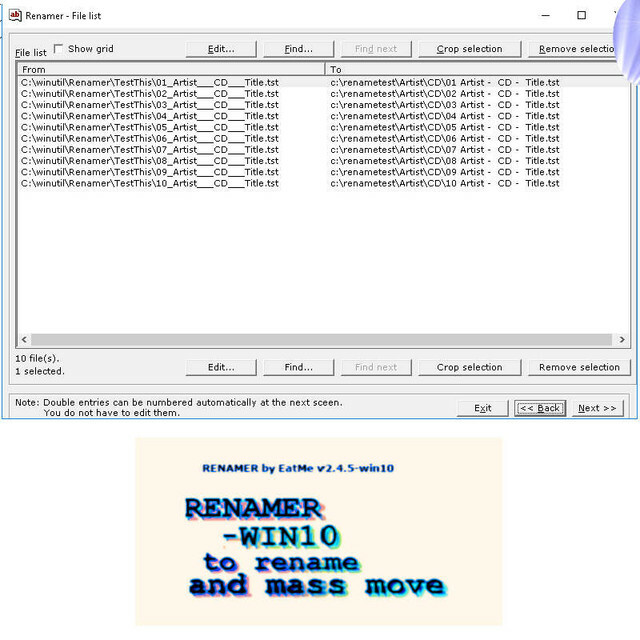 Only by providing administrative priviledge, asked for, with theRenamer 2.4.5 Windows 10 & Windows 7 installer/ 882 KB, installation of MSCOMCTL.OCX is included on Windows 10 & Windows 7.
after backing up your file lists and undo files, simply delete the Renamer program directory/folder and its subdirectories/subfolders from your drive. The Windows registry: HKEY_CURRENT_USER\Software\VB and VBA Program Settings\EazRENAMER\ contains some stored program data, no need to remove this small sized program data, also: it can be re-used after later re-installation. You can see how many presets exactly are present in the subkeys underneath. The NrOfPresets should match the highest number found in the subkeys. 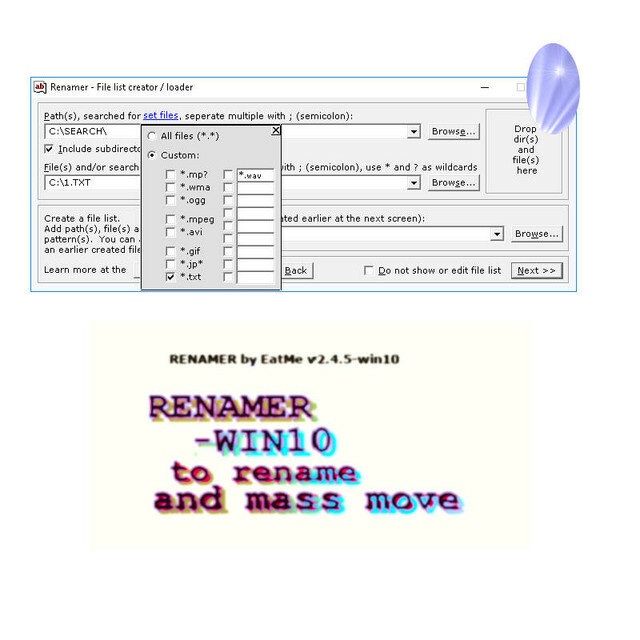 Renamer is a program that can rename and move files,create directories from filename(s) and set file attributes. See the full specifications below for details. To create a list of files you can input path(s), file(s),search pattern(s) and / or an earlier created file list. Last 26 entered are saved, and default paths can be set for dialogs. For more info about creating a list of files, press the Help button on the file list creator / loader screen. You can save, make changes in and view the created list of files. You can make changes in and view the renaming list. You can save an Undo file and load Undo files to undo renaming. These Undo files can be loaded with or without the option to restore changed file attributes. Duplicate output filenames can be automatically numbered or not renamed and reported.